Horses are definitely unpredictable animals, and that is what makes trail riding such a dangerous sport. Just the same, there are a few things that seem to hold true for most horses in most situations. Of course, there are always exceptions to the rules, and sometimes a predictable horse will do something very uncharacteristic. Here are a few things to keep in mind when you wonder how your horse will act in a particular situation. They can help you know what to expect and guide you to make safe decisions. 1. Horses will typically go faster on the way home than on the way out. 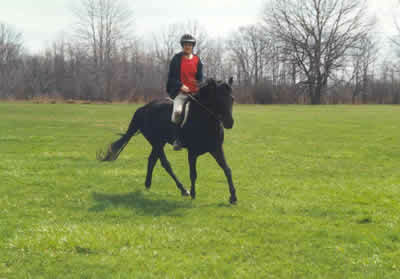 Generally, horses are in a hurry to get back to the safety of their herd, food and rest. The closer they get to home, the faster they will go. There are exceptions to this rule. My horse, Mingo, doesn't seem to vary in speed even on the last leg of the journey. He doesn't believe in hurrying. 2. If you always do the same thing in the same spot, your horse will want to do the same thing in the same spot. If you ride the same trails often, the best thing to do is vary your routine. I've seen horses get very nutty at the bottom of hills that their owners let them run up. It creates a problem if there is someone riding down the hill, and you don't want to run up at them. Even an experienced rider like me falls into this trap. There are some particularly great places to canter on our trails, and we look forward to these places as much as the horses do. We will walk or trot in these spots every now and then to enforce some discipline. Sometimes this rule helps you out, though. If you always stop at an intersection before crossing, your horse is more likely to cooperate with you when you have to stop for traffic. 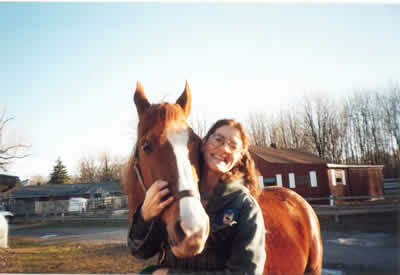 An old friend told me about a horse he rode when he was a young man. They would get to a certain spot on the trail, and the horse would come to a dead stop. Nothing would get the horse to budge until you leaned back in the saddle like you were taking a drink from a bottle. Here, the man who usually rode the horse would always stop in that spot to take a swig from the flask of whiskey he carried with him. 3. Horses are harder to slow down or stop on the way back to the barn. Keep this in mind when you want to canter up to an intersection or some other obstacle. Just because he stopped well on the way out, there is no guarantee he will do the same on the way home. Give yourself more distance to stop or slow down. 4. The colder the weather-the sillier horse. This is something to remember if you are wondering how your horse will behave on a particular day. The colder the weather, the safer and more cautiously you should ride. I honestly couldn't safely ride Cruiser on the trail when it was below freezing until he was 6 unless he was lounged our turned out first. Even now, at the age of 13, he can still be unpredictable when it is cold. Conversely, in the summer, Mingo is so quiet and slow, I could read a book while riding at a trot. Sometimes I think I could take a nap, but then he would probably stop to graze. 5. A horse that is sensibly trail ridden will only improve. I put the emphasis on the work "sensibly." A rider who "hotrods" her horse, abuses his mouth with bad hands, asks him to do things he isn't ready for, allows him to act aggressively towards other horse, etc., can't expect her horse to get better-only worse. With sensible riding, though, even a terrible horse will get better. I've heard it said that the best thing for a horse is a lot of wet saddle blankets. Just make sure is sensible sweat. 6. If your horse has been cooped up for a while, turning him out to play, even for just a few minutes, will improve your trail ride. A horse that is deprived of time to play will take it out on you. I find that even if they have a few bucks in them but have the self-discipline to refrain from bucking, they tend not to be as cooperative. Once again, the weather will play into this. A cooped up horse in the cold weather is worse than one in hot weather.